89. Torre Annunziata, Roman ruins under coastal road, at the site of La Perla. Excavated 1963 or 1964 and 1970. Important Roman ruins unearthed beneath the coastal road, at Torre Annunziata, during some excavation work at the site of La Perla, in 1963 (Fergola gives 1964). Casale A., Bianco A., Primo contributo alla topografia del suburbio pompeiano: Supplemento al n. 15 di ANTIQUA ottobre-dicembre 1979, n. 118, p. 46-7. Malandrino, C., 1977. Oplontis, Napoli, p. 48 and fìg. 9 n. 2. Kockel V., 1985. Funde und Forschungen in den Vesuvstadten 1: Archäologischer Anzeiger, Heft 3. 1985, p. 547. Villa 89. Torre Annunziata, Location plan. There were found rooms with walls painted with marine subjects and mosaic floors, an exedra surrounded by columns with overhanging arches, a swim pool and a network of tunnels for water. Near the building there were terraces, partly paved with mosaic, at different levels, sloping down towards the sea, while the fragments of a round Obsidian top were the only remains of a precious table that adorned one of these terraces. It was clear to Malandrino that these remains, which were found three years after the remains of the Baths of M. Crassi Frugi and only a brief distance away, were the continuation of those baths. In fact, the connection is documented by the plan of Liberatore which shows a tank in the centre, to be located almost in correspondence with the existing one, and the structures that were brought to light during the works are connected with the recent findings, which form the continuity of those buildings which extended with various rooms in the eastern direction. See Malandrino, C., 1977. Oplontis, Napoli, p. 48-9 and fìg. 9 n. 2. Secondo Casale e Bianco, “Ruderi romani di notevole importanza rinvenuti sotto la strada litoranea, a Torre Annunziata, durante alcuni lavori di sbancamento (cantiere "La Perla”), nel 1963”. 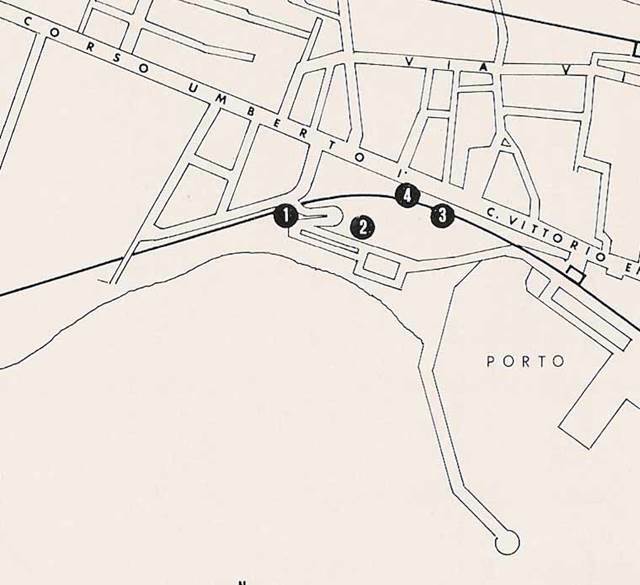 According to Casale and Bianco, “Roman ruins of considerable importance found under the coastal road, in Torre Annunziata, during some excavation work (shipyard "La Perla"), in 1963”. See Casale A., Bianco A., Primo contributo alla topografia del suburbio pompeiano: Supplemento al n. 15 di ANTIQUA ottobre-dicembre 1979, n. 118, p. 46-7. Nach Kockel, “Weitere bedeutende Reste römischer Bauten wurden 1963 oberhalb der Küstenstraße sofort zerstört (Abb. 23 Nr. 89)“. According to Kockel, “Other important remnants of Roman buildings were immediately destroyed in 1963 above the coastal road (Figure 23 No. 89)”. See Kockel V., 1985. Funde und Forschungen in den Vesuvstadten 1: Archäologischer Anzeiger, Heft 3. 1985, p. 547. According to Fergola, more than one scholar has held the opinion that these finds should be related to those of the baths but the distance between the two sites as well as the nature of the structures, point to buildings that are distinct and not connected. The reports of the Superintendency were accompanied by plans, and a study of these along with the photographs, some of which were published in newspapers at the time, shows what seem to be richly decorated spaces belonging to the residence of a person from a rather elevated social class. In his opinion it is another example of a residential villa of the Roman period facing the sea, one of many that dotted the Vesuvian coast. To the east of these rooms was a large, apparently uncovered space with colonnades facing each other on two sides suggesting a peristyle. Other spaces, paved in mosaic, opened onto the peristyle (2.15). Two lines in the middle of the plan placed at right angles probably traced the edges of a natatio (2.16) that occupied the centre of the garden. On the opposite side of the garden terraces led down to the sea, giving a panorama over the gulf. Recovered from material already dumped into the sea were bronze door pivots and hinges; fragments of lead pipes; sheets of marble, some coloured; some blocks of obsidian, probably belonging to a table; a roof tile with the stamp of the maker Luci Eumachi Erotis; sections of two inscriptions on a marble panel, with the letters ILVA V on the first and SI VA on the second, where they take up two lines; and various fragments of painted plaster, stucco cornices, and pieces of mosaic. A headless dog on his hind legs with its body drilled to fit a pipe, may have been part of a fountain. Finally, in 1970 when further construction work took place, there was found terra sigillata Arretine cup (2.17), of mediocre workmanship, with a contoured foot and hemispherical body decorated with masks and vegetal motifs. Also found was a common ceramic pitcher (2.18) coated with a red slip and with a slightly raised foot; a low, wide belly; a single-lobed mouth; and a ribbon handle attached from the lip to the shoulder. FIG. 2.13 Plan of structures found at the La Perla construction yard. FIG. 2.14 Contemporary newspaper photograph with remains of pavements and frescoes visible in a room. Il Pungolo, 18 June 1964. FIG. 2.15, A room paved in mosaic and fallen columns belongs to the peristyle. FIG. 2.16 Part of a natatio.